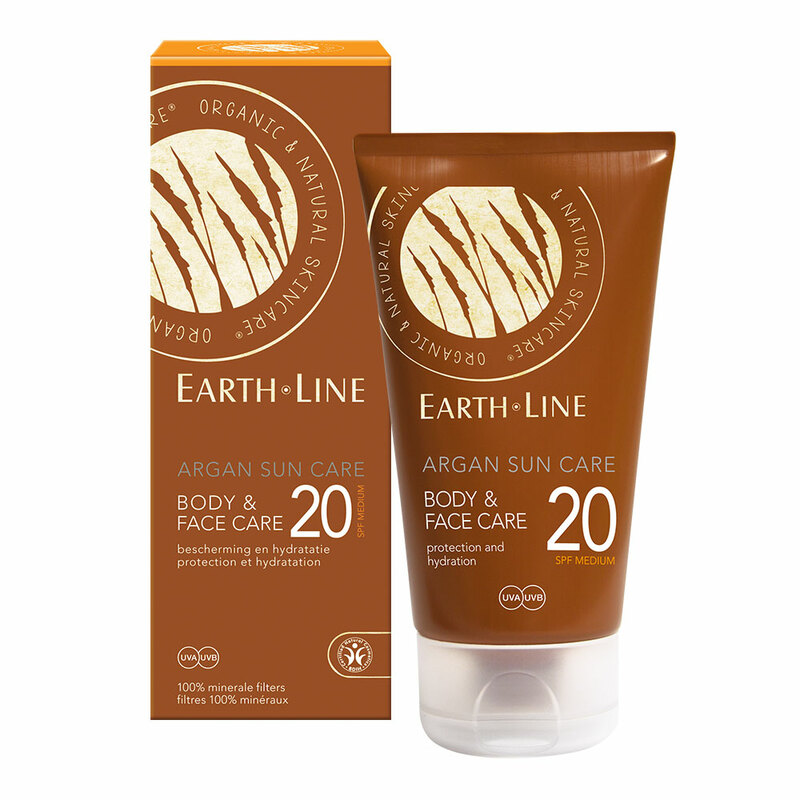 Body & Face Care SPF 20 is de nieuwe standaard in veilig zonnen zonder synthetische filters. De synthetische filters zijn vervangen door 100% breed spectrum non-nano minerale filters die direct bescherming bieden tegen UVA/UVB stralen. Gecertificeerd biologische Argan olie, Kokosolie, Macadamia olie en Sheabutter hydrateren en voeden de huid optimaal. Geschikt voor alle huidtypen en kinderen. Breng de crème aan op lichaam en gezicht vóór blootstelling aan de zon. Regelmatig opnieuw insmeren, vooral na het zwemmen, transpireren of bij langer verblijf in de zon. Zon veilig en met mate. Aqua (Water), Caprylic/Capric Triglyceride, Titanium Dioxide, Rosa Damascena Flower Water**, Cetyl Alcohol, Glycerin, Stearyl Alcohol, Polyhydroxystearic Acid, Polyglyceryl-10 Laurate, Alcohol, Alumina, Zinc Oxide, Sodium Stearoyl Glutamate, Aluminum Stearate, Parfum (Fragrance Natural), Argania Spinosa Kernel Oil**, Helianthus Annuus Seed Oil**, Glyceryl Caprylate, Macadamia Integrifolia Seed Oil**, Polyglyceryl-2 Caprate, Potassium Lactate, Simmondsia Chinensis Seed Oil**, Phenethyl Alcohol, Stearic Acid, Sucrose Stearate, Butyrospermum Parkii (Shea) Butter**, Tocopherol, Lactic Acid, Ascorbyl Palmitate, Calendula Officinalis Flower Extract**, Cocos Nucifera Oil**, Plantago Major Leaf Extract**, Symphytum Officinale Root Extract**, Citric Acid, Squalane, Porphyra Umbilicalis Extract, Isostearic Acid, Xanthan Gum, Aloe Barbadensis Leaf Juice Powder**, Sodium Benzoate, Lavandula Hybrida Grosso Herb Oil, Sodium Lactate, Benzyl Benzoate*, Citral*, Citronellol*, Geraniol*, Limonene*, Linalool*.